I know it won’t last, but in this heat, getting dinner ready in the hottest part of the day can be a nightmare of sweat and cursing. Well it is my house. In summer, salads rule, and if you’re brave enough to turn on the hob, maybe a piece of meat to go with. Nothing fussy, with as little heat generated possible. Here are some side dishes that are simple and yet super delicious. The bean salad is a favourite passed down from mum and the pea and mint salad is happy discovery from when a friend came to dinner. It’s even too hot to blog. 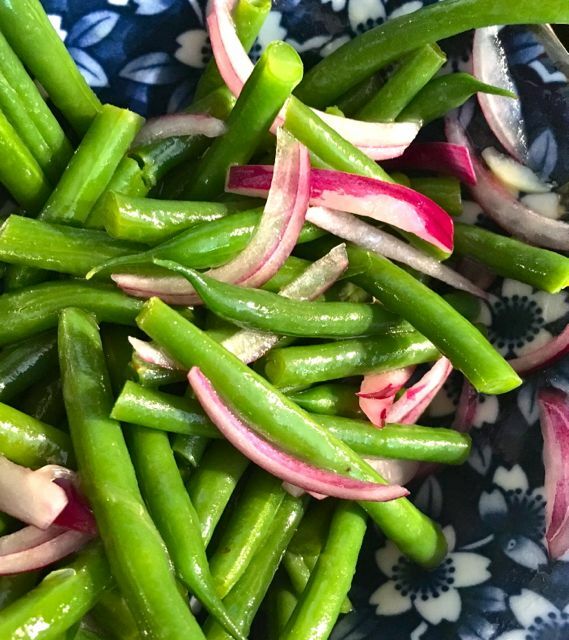 Steam some green beans, finely slice some red onion. Let the beans come to room temperature and then toss with the onions and dress with olive oil, red wine vinegar and season with salt. Simple I know, but this is a fresh and delicious way to eat your greens on a hot day. Most of us have broad beans and peas in the freezer. Some of us even have mint growing wild in the back yard and some sort of salad leaf can usually be foraged from the fridge. This salad comes together quickly and can be riffed on if you don’t the exact right ingredients. The basic rule is keep it green. Smash up the peas and beans a little with your fork before you toss all the ingredients together in a bowl. Make a dressing by pouring 2 tbs vinegar, 1 tsp seeded mustard, 1 tbs honey, 1 tbs olive oil into a jar and shake it around. Dress and season with salt and pepper.